The largest disparities, in terms of access to smart phones, was over 50 percent in the demographic categories of age and education levels (18-35 versus 65 and older and less than high school diploma vs college degree respectively). Approximately 32 percent of people identified as not using broadband technology cited frustration or difficulty in usage of the technology. Sixty-three percent of new Internet users surveyed stated that they would need someone to help them navigate the Internet. The result of these limitations can cause lost economic and personal opportunities. For example, Aaron Smith’s 2016 study of the digital economy noted that users of the digital sharing economy (e.g., Uber, Airbnb) tend to be more affluent, in possession of advanced education degrees and younger. Efficient use of public services might also be impacted. A white paper issued by Maria E. Wynne and Lane F. Cooper and co-sponsored by Microsoft provided an overview of the deliberate processes government entities undertook to provide internet-based functions to constituents. Popular online functions include licensure registration/payment functions, reporting of quality of life issues, and crime reporting. Government officials believe the online services provide more timely and flexible access. The trend of online government services is significant. For example, the Rutgers University e-Governance Institute and the Public Technology Institute developed a performance measurement tool called the Rutgers E-Governance Performance Index. This index is used during a biennial global survey of government websites. The top countries are ranked according to five categories that include usability, services and citizen and social engagement. As of 2016, approximately 104 metrics were used. 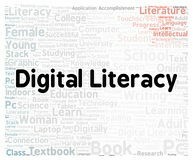 Digital literacy strategies are complex because it is presumed that skills vary by age, education or income. However, the incorporation of the concepts of human capacity and enabling environment enablers, as identified in the study “Who’s Responsible for the Digital Divide? Public Perceptions and Policy Implications,” can help strategic planners of digital literacy programs identify guiding principles that make programs more relevant and sustainable to specific target demographics. City of Philadelphia KEYSPOTS Digital Literacy program (2010- Present):Citywide training program to use technology and Internet access to address education, achievement and vast unemployment. Identified the demographic categories targeted for digital literacy programs required additional support. Leverages relationships with local churches and community organizations and government agencies to provide neighborhood-based classes, facilitators and content. Rutgers University Newark/ City of Newark My Newark App (2014-Present): Jointly developed mobile application by Rutgers University Newark and the City of Newark. Functions include community information portal, incident reporting and payment processing. Mobile application platform. Pew Center research showed that access to the Internet becoming more prevalent through mobile/ wireless networks compared to broadband networks. Newark residents and commuters can retrieve information about jobs and city services and report quality of life issues outside of office hours. Response times tracked and discussed by city officials. Research published by Sharon Weiner in 2011 evaluated the public policy development process for information literacy. The study provides insight that helps planners of digital literacy programs because digital literacy and inclusion involves collaborations with the public and private sector. Weiner asserted that policy involves processes in which “problems, ideas and politics combine with choice opportunities to move issues onto the decision agenda of the national government.” Weiner also noted that when research is used to shape policy positions, personal perceptions based on values and political feasibility might influence how data is interpreted. Education technology curriculum development and deployment is intended to reduce the digital divide for future generations. However, public policy debates about the access and effectiveness of education technology tools can be difficult for the reasons of personal perceptions and politics. In the next article, policy development strategies for education technology will be analyzed. Author: Cassandra Arnold is a graduate student at Rutgers University – Newark School of Public Affairs and Administration. She is pursuing a master’s degree in public administration with a concentration in nonprofit management. Cassandra is also learning digital education practices as part of a non-degree certification program at Rutgers University Graduate School of Education. She can be reached at [email protected].